There are no comments for Kar-mi And The Great Victorina Troupe Originators. Click here to post the first comment. 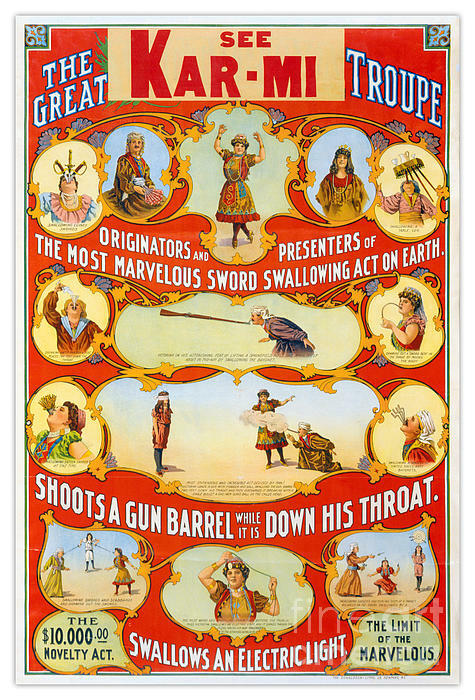 Restored and digitally enhanced vintage poster of The great Victorina Troupe originators and presenters of the most marvelous sword swallowing act on earth. 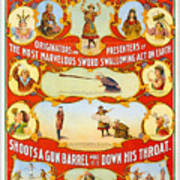 See "Kar-mi" pasted over Victorina on top of poster; Victorina also performed as the magician, Kar-mi. Image courtesy of the Library of Congress. 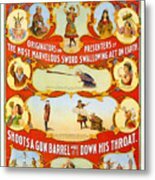 Mint condition reproductions of the most popular vintage posters are our specialty. 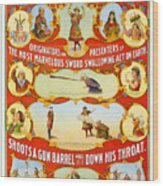 The vast majority of our catalog consists of very high resolution scans of advertising and travel posters that have been manually retouched. You will receive reproductions with a like-new feel with vivid colors and the highest level of detail you will not find anywhere else.